Until the 1920’s, the tea industry’s main outlet was Great Britain, where consumption had been rising significantly since the beginning of the century. This situation changed after the First World War and the economic crisis following the 1929 Wall Street Crash. Traditional surpluses in tea production from British India and Ceylon surged, while increasing pressure was felt from low-cost teas produced in the Dutch colonies. In an effort to stave off their competitors, British planters promoted home-grown teas, supporting preferential tariffs or using imperial references in their advertising. Hence they hoped, the patriotic inclinations of the British consumer would offset competition. This was largely ignoring the already multinational nature of major British tea companies, which invested just as well in Dutch plantations as they did in British ones. Realizing their intertwined interests, British and Dutch tea producers teamed up and rethought their advertising campaigns on a global scale. In this context, the newly founded International Tea Market Expansion Board, or ITMEB launched a series of bold new ad campaigns in 1936, no longer solely intended for the British public, but also aiming new markets such as North-America and India. Created by renowned designer Edward McKnight Kauffer, this colorful, playful and dynamic poster was intended for the UK market. Kauffer had trained as a painter in Chicago and spent much of his career in England, where he achieved success and honors through numerous commissions, following the popularity of “Flight,” published in Colour Magazine in 1919 (see below, figure 1). 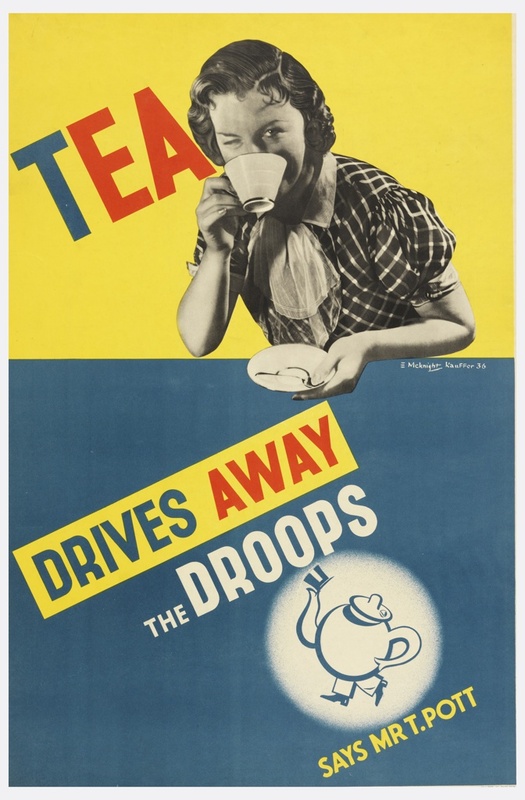 He designed the Tea Drives Away the Droops poster a year before a prestigious exhibition held in his honor at the Museum of Modern Art in New York . Figure 1. Flight (detail) 1919. Collection of the Museum of Modern Art, New York. Photograph copyright 1992, The Museum of Modern Art. Taken from aiga.org. Due to his training and sensibility, Kauffer was profoundly influenced by contemporary artistic movements. He splendidly integrated them into his work, seeing no reason to oppose fine and applied art. His singular approach gave way to advertisement designs that qualify as works of art in their own right. With its bold colors and straightforward scheme, divided into two parts and exhibiting a clear message with slanting typography, this design reflects his ability to simplify to great effect. Representative of the decline of colonial references in tea advertising, imperial and nationalistic allusions have vanished. The invigorating message – along with the image of “Mister T-Pott,” a creation of the Board – instead appeals to the supposed desires of the working and middle-class consumer. The design also features British-Italian lead singer and actress Gracie Fields, then at the height of her fame, following her performance in the hit 1931 movie Sally in Our Alley. As the “Lancashire lass,” Fields embodied aspirations of social mobility and was thought to be a figure the working-class could identify with. She was the best paid British actress of her generation, a fact that goes to show just how ambitious the ITMEB was in its efforts to find new outlets for the tea industry. This is an early and particularly representative example of globalization in advertising, speaking directly to the consumer as an individual, “sensual” being, with the varying degree of manipulation this can incorporate. Erika Rappaport, “Tea Revives the World: The Decolonization of Tea Advertising During the Depression”, in Moving Around: People, Things, and Practices in Consumer Culture. Edited by Hiroki Shin, Shinobu Majima and Yasuke Tanaka (Forum for History of Consumer Culture, Tokyo, 2015), p. 28. My personal thanks go to Dr. Rappaport for her help, allowing me to use her article due to be published. In addition see Bishnupriya Gupta, “Collusion in the Indian Tea Industry in the Great Depression: An Analysis of Panel Data,” Explorations in Economic History 34, 1997, p. 155-173. Founded in 1935 as an international body, promoting British and Dutch teas across several continents. For a complete overview of his life and career, see the entry on the AIGA website: http://www.aiga.org/medalist-emcknightkauffer/. See page 40, note 74 of Erika Rappaport’s article referenced above in note 1 for additional references. Geoffrey Ripert is a graduate curatorial intern in the Department of Drawings, Prints and Graphic Design at the Cooper Hewitt, Smithsonian Design Museum. Studying at the Ecole du Louvre in Paris, he is currently writing his thesis in Digital Humanities on the Jean Léon Decloux Collection.